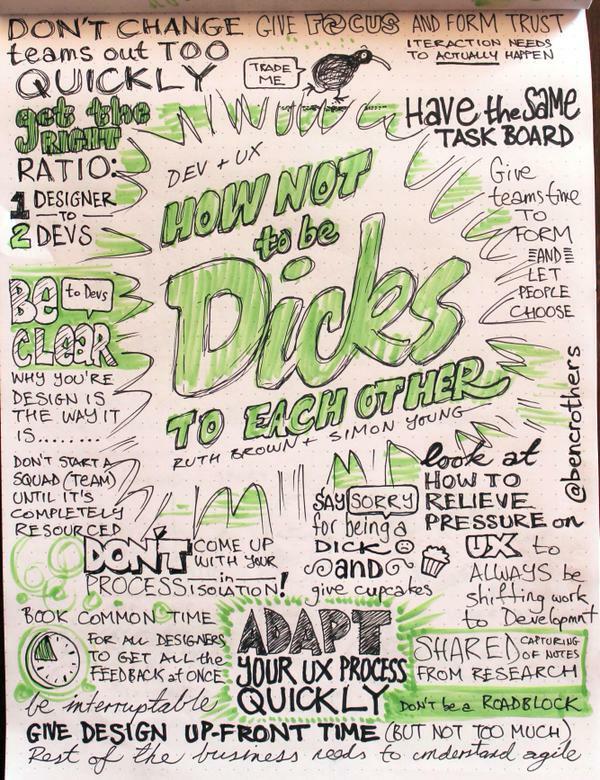 Last month I had the opportunity to attend the Agile UX conference in Sydney. A one day conference, run by UX Australia, the topics centred around “designing great user experiences within an Agile environment”. For me, as a non-UX practitioner, my goal was a greater insight into some of the challenges that others in the UX field are facing. All of the presentations were good, but the highlight for me was “Dev & UX: How not to be dicks to each other” by Ruth Brown and Simon Young of www.trademe.co.nz. This was the first time I heard anything in detail about Trade Me, and I was impressed by what I heard. By taking through their journey from ‘one cupcake’, ‘2 methods’, ‘3 screw ups’, ‘4 nailed its’ to ‘5 bottom lines’, I gained a real insight into how their company embraces innovation and learning. From startling revelations such as their ratio of UX to developers (1 to 2! ), to experiments in workspace arranging and self-selecting teams, you got a real insight into a company that is willing to take risks, develop experience and adopt new ways of working. Certainly the prospect of putting all your people in a room, explaining the company objectives and the teams that are required and then asking them to pick their own co-workers was pretty confronting. I can only imagine what was going through those people’s minds during that process. For me, that company spoke not only about agile processes, but an agile approach to everything. Even more, it spoke loudly about the culture they have managed to build around innovation, feedback and honesty. I’ll certainly be keeping an eye on developments in trademe in the future. One other concept that resonated with me was raised by Warwick Bracken in his presentation “Managing UX-pectations”. Apart from a well thought out framework for talking about UX expectations and quality, he talked about the concept of “UX debt”. As a developer by trade, the concept of “technical debt” is one I am aware of, but I hadn’t previously considered that the same approach can be applied to UX decisions. So the next time you are having a discussion about the proper way versus the time available to implement it, keep in mind that a win-win scenario is to both implement the quick win and to write up a “UX debt” card to come back and fix it up in the future. Overall the conference was well run, with a great spread of interesting speakers. Look for more Shiners at the upcoming UX Australia conference in August. Mark Johnson is one of the Founders and Directors of Shine Solutions Group, a Technology Consultancy in Melbourne, Australia.